The typical subspecies of Limentis arthemis and some "hybrids" with subspecies astyanax have prominent white bands on both wings. 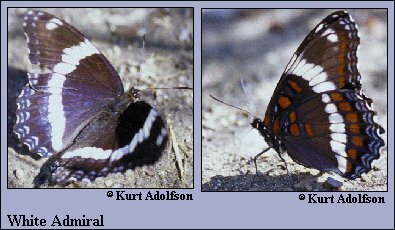 The range of this subspecies is shown because it looks so different from the red-spotted purple form. The fact that both forms interbreed over a broad zone and produce fertile offspring is why they are treated under the single species (see page for Limentis arthemis).